The Da Vinci Code has stirred up a new interest in Mary Magdalene, but it seems obsessed with an imagined sexual relationship between her and Jesus. Fr John Murray PP takes this as his starting point, but goes on to highlight the more authentic tradition about the saint. The novel, The Da Vinci Code, has stirred up a good deal of controversy, with its theories about the lost cup of the Last Supper and the identity of the ‘beloved apostle’. The book claims that Mary Magdalene was this anonymous disciple, and that the Church has kept this secret from mankind in its efforts to maintain its power and control over people’s lives. Yes, it all sounds a bit fanciful, doesn’t it? Yet, lots of people are currently buying into the fiction. Perhaps we need to look at the Scriptures to get a clearer picture of the real Mary Magdalene and her true message for today. The sources I will suggest are not the various Gnostic texts which abounded in the early centuries, but the four gospels which were accepted by the Church as authentic, virtually from the beginning. These are the texts which were accepted by saints and theologians like Ignatius of Antioch, who died in Rome in 108, and Irenaeus of Lyons, who was bishop from 180-203. There were other ‘gospels’, but in time they were rejected, because they weren’t consistent and authentic to the real Jesus, who had revealed himself as God and man in Palestine in the early years of the first century. There are various Marys mentioned in the New Testament. None receives as much attention as Mary, the Mother of Jesus, but close behind her is Mary of Magdala. The Catholic Church, in its latest edition of the Calendar of Saints, distinguishes between Mary of Magdala, Mary the sister of Lazarus, and the sinful woman who weeps over the feet of Jesus (Lk 7:36-50). Nor is she to be confused with the nameless woman caught in adultery (Jn.8:3-11). 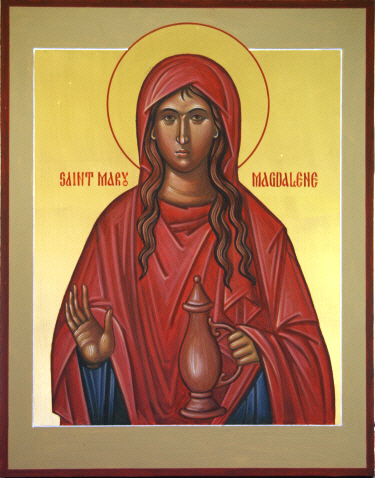 Mary of Magdala, I believe, has four messages to give us. First of all, she is a disciple of Jesus. It was unknown at that time for women to be disciples of rabbis, and yet all four evangelists mention her, while Luke and Matthew specifically state that she and some others looked after Jesus and his closest disciples. Her message here is one of service, for she considered it an honour to minister to the Lord. 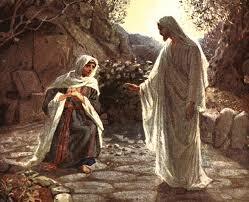 This she did to the end, when she came with others to anoint his crucified body as it lay in the tomb. Throughout the centuries, women have ministered to the Lord, often in quiet and humble ways. Increasingly, that role has been, and will be, extended, as they seek to serve the modern Church in positions of leadership and responsibility. Pastors must have eyes to see and hearts that are open to their many and varied gifts. We are told that Mary had ‘seven demons’ cast out of her by Jesus. We don’t know if these were spirits of a sinful nature, or if they refer to some sickness from which Jesus freed her. In another passage, Jesus mentions a man who was freed in a similar way, but who later succumbed to seven other demons. Mary, once freed, never fell prey again to the power of her former problems, and followed Jesus resolutely, even to the foot of the cross on the hill of Calvary. You could say she was a fragile person, but what a beautiful lesson for us to know that Jesus can use us even when we are damaged and have known sin or distress or sickness. As a result of books like The Da Vinci Code, there is much unhealthy speculation these days about the supposed relationship of Mary with Jesus. Did the Church keep hidden a ‘terrible secret’ that their relationship was more than platonic? We know there is no foundation for such speculation, which sometimes says more about the authors than the matter they write about. The Church today is increasingly highlighting the beauty and sanctity of marriage. How sad it is, then, that the world cannot recognise the dignity and beauty of chastity! Twenty-five years ago, the lyrics of Mary Magdalene’s song in the pop musical, Jesus Christ Superstar, gave a revealing insight into this beautiful relationship: ‘I don’t know how to love him / What to do, how to move him. / I’ve been changed, yes, really changed. / In these past few days, when I’ve seen myself / I seem like someone else’. In meeting Jesus, Magdalene discovered a love greater and deeper than she had ever known before. How exciting and wonderful it is for anyone – woman or man – to fall in love with the truly Great Lover! The world needs to hear that message. Maybe that’s the real reason why the figure of Mary Magdalene is so prominent today. 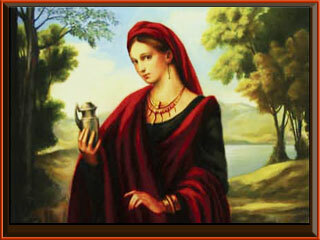 Finally, there is the role of Mary Magdalene as the ‘first announcer of the Resurrection’. Even when the other disciples doubt her word, she is faithful in proclaiming the message that he is risen. Did Jesus choose a woman for this role because of the inherent fidelity of a woman’s heart? Despite the apostles’ incredulity, she stuck to her guns. In Zeffirelli’s film, Jesus of Nazareth, Mary is given the line, ‘He told me to tell you, and I have done so!’ That about sums up her courage and fidelity. Today, in a world of faithlessness, we also are called to proclaim the truth of his resurrection, even when others do not believe, or give in to doubt. Mary Magdalene knew that Christ had died. Was she not one of the few beneath the cross at that terrible moment? Yet she was unwavering in her belief that he was risen. No one was going to stop her telling that Good News to everyone she met. As she came away from the tomb on that first Easter morning, she already knew in her heart what St. Paul would say to the Corinthians a couple of decades later: ‘If Christ has not been raised, your faith is pointless, and you have not been released from your sins… In fact, however, Christ has been raised from the dead as the first-fruits of all who have fallen asleep’ (1 Cor. 15:17.20). Mary Magdalene was the first to grasp this astonishing truth, and to proclaim it to the world. P.S Pope Francis has established that from now on the celebration of St Mary Magdalene be inscribed in the General Roman Calendar as a Feastday for the whole church. This article first appeared in The Messenger (April 2005), a publication of the Irish Jesuits.